Valve has announced the public launch of Steam's new TV-oriented "Big Picture" mode, which makes it easier for PC gamers to step away from their desk and enjoy titles from a couch. The new interface was first teased in early 2011 and finally hit beta this September with a positive reception despite minor kinks. 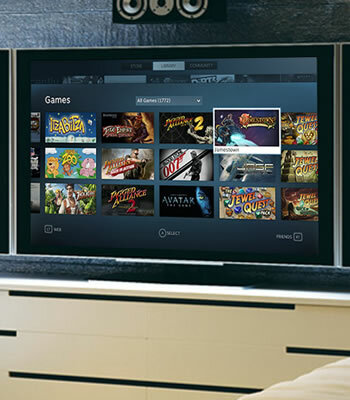 It's not clear how serious Valve is about bringing Steam to the living room, but it might be interesting to see Big Picture positioned as an all-around entertainment hub with video streaming -- not unlike what we've seen from online console platforms. For whatever it's worth, the interface currently offers a Web browser. Big Picture is available worldwide in over 20 languages and can be enabled by clicking the "Big Picture" icon in the upper right corner of the Steam client. Naturally, you'll also have to hook your PC's video and audio outputs up to whatever large screen you intend to play on (many modern GPUs support audio-out via HDMI). That's about as technical as the process gets, but it could be a little tricky if your PC isn't close to a TV and you have to route wires through your home. As a friendly tip, if you're shopping for a lengthy HDMI cable, Monoprice has some decent rates and they offer a video tutorial on picking the right wire for your needs.